When the one-room country schools were closed, a bus was needed to bring the farm kids to the nearest town. Hamilton County students would learn and then graduate from the school in the nearby town: Jewell High School, Stanhope High School, Ellsworth High School, Randall High School, Kamrar High School, Stratford High School, Webster City High School, Blairsburg High School, or Williams High School. St. Paul Lutheran Church in Boone County (south of Stanhope and close to Highway 17) had a school (photos here) for students through their 8th grade. Some of these students graduated from Hamilton County schools, such as Stanhope High School (or after 1962, from South Hamilton High School). On September 29 1958, the South Hamilton Community School District was approved by voters at a special election. After the reorganization was upheld in the courts and legalized by the state legislature, it began its operation on July 1, 1959. The new district was the largest Hamilton County school in land area, and with an enrollment of 1,254 students, ranked as the seventy-sixth largest school in Iowa. John T. Cannon of Stanhope was elected district superintendent with M. B. Curdy and A. I. Kingery serving as assistant superintendents. Each of the four towns (Jewell, Ellsworth, Stanhope, and Randall) had always operated their own K-12 program. It was the philosophy of the board that to provide proper breadth of programs at efficient expenditure levels, classes of at least 100 students per grade were desirable. This meant a central facility, and because of transportation and auxiliary expenditures it seemed feasible to plan for a combination junior-senior high school to accommodate all students at these levels in one building. In 1960, a proposed new high school building plan was received from architects Frangkiser & Hutchens of Cansas City, but in February and June of 1961, bond issues for $1,130,000 for the construction of a new high school were defeated by voters. In 1961, the school board approved the proposal to name athletic teams Hawks and Hawkettes. In December of 1961, the until September of 1962, a central high school was established at the Jewell center. In the 1962-1963 school year, all South Hamilton senior high student (grades 10-12) attended high school in Jewell and students grade 7-9 attended one of the twin junior highs in Ellsworth and Stanhope. Kindergarten through six graders attended school in the four town centers, Jewell, Ellsworth, Stanhope, and Randall. 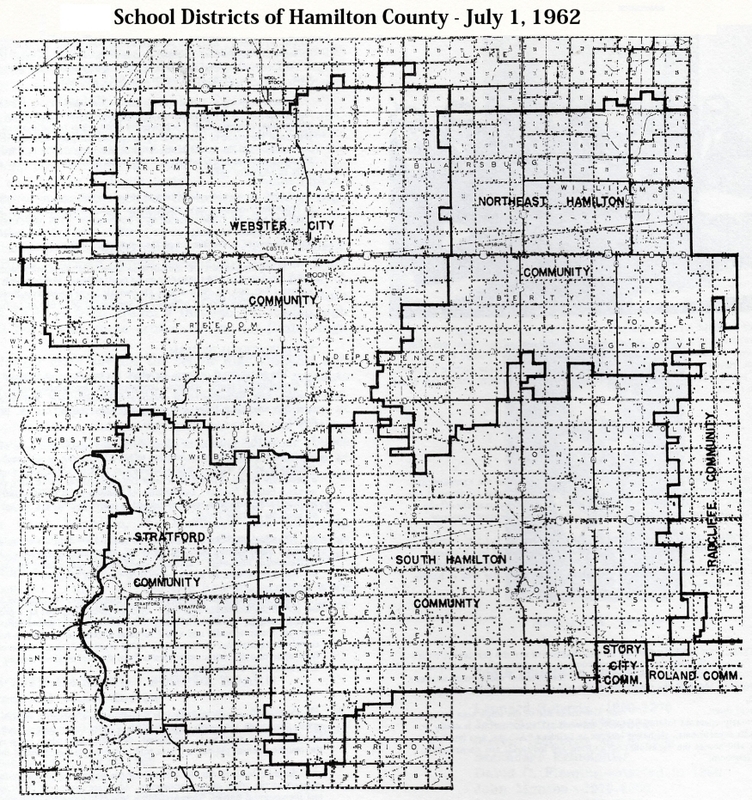 By 1962, Hamilton County school districts had been reduced to four large community school districts; Northeast Hamilton Community School, South Hamilton Community School, Stratford Community School, and Webster City Community School. 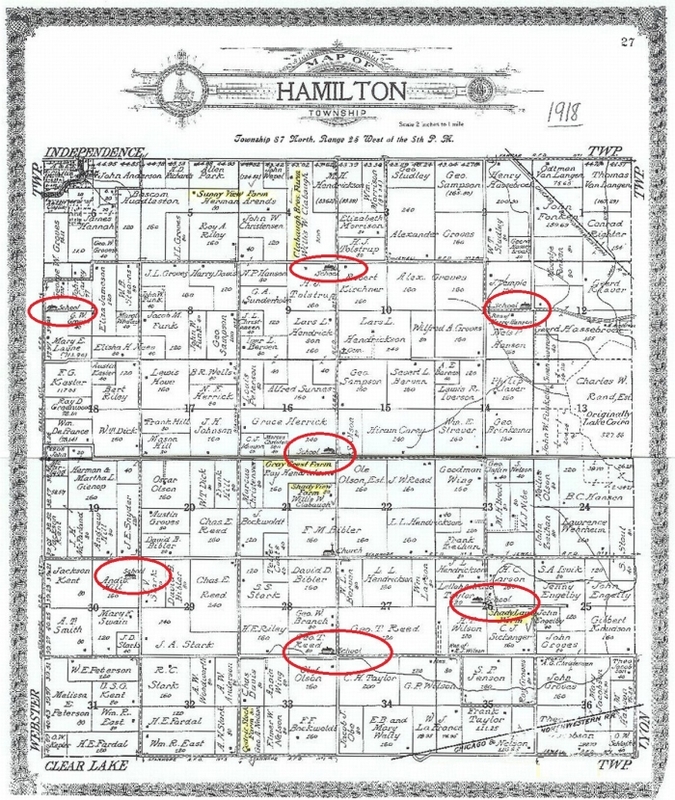 Jewell was once home to a college, the first college in Hamilton County. The body having done work among the Norwegian Lutherans in Iowa is "Hauge's Synod," which had fourteen pastors and thirty congregations, with a membership of 5,866. They had a higher institution of learning, — Jewell Lutheran College. This college was established in Jewell in 1893 by the Jewell Lutheran College Association. The majority of the members of this association were Scandinavian Lutherans from the surrounding counties. The house pictured on the right was the residence of the Jewell Lutheran College president, and is now used as the home of the superintendent of South Hamilton Community School. In 1894, the Jewell Lutheran College had 30 students, required $27.50 tuition (which included room, board, tuition, and books) and paid teachers a salary of $400. In 1897, it became apparent that larger support was needed for the school, so the college and all of its property was transferred to the Iowa District of the Hague Synod, under whose management the college grew and progressed. 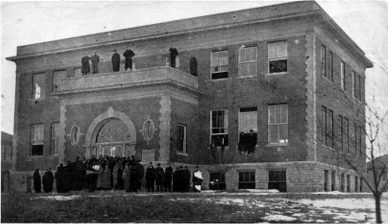 In 1903, the main college building burned, killing two students: Julius Peterson and Burton Millang. In February of 1904 it was decided to rebuild two new buildings. One was Main Hall and the other was a ladies dormitory. When the college was closed in 1925, the property was purchased by the Jewell School District. This building was the Jewell Lutheran College administration building, which became Jewell High School after 1925 when there no longer was a college in Jewell. This structure then became the high school for the newly formed South Hamilton School when students from the four communities and surrounding area were brought together in 1962. The high school building was located at north of the elementary school gym, shown at right in this image. It sat empty for a number of years after students moved into the new South Hamilton building and was finally demolished in 1973. South Hamilton's elementary school gym and the Superintentent's home are the only remaining buildings from the Jewell Lutheran College days. In attempting to fulfill the mandate of reorganization, to insure the children of the district a brighter hope for the future by providing them the best possible educational opportunities, petitions for bond issues to build a new facility were presented the board of education by interested patrons. 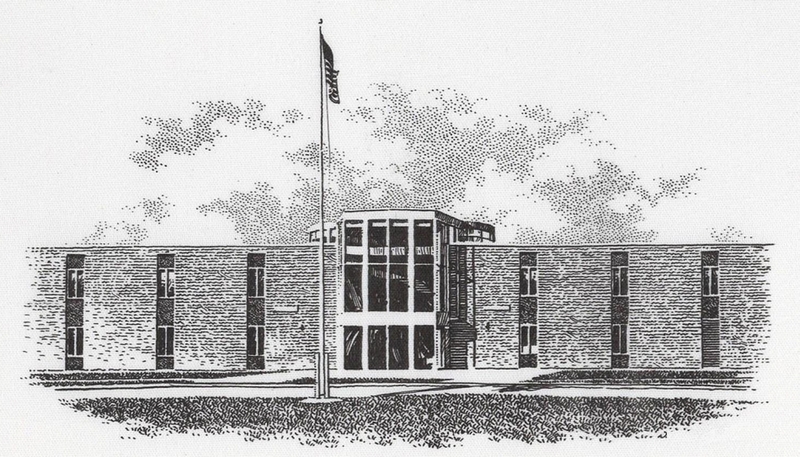 In order to assist patrons, committees, and the board of education in planning for the new facility, the architectural services of Frangkiser and Hutchens of Kansas City were retained by contract in March of 1960. Yet at issue was where to build a new junior-senior high school building for grades seven to twelve. Seven bond issues were put before the voters. If the location was cited in Jewell, the outlying areas tended to vote no. If the location was cited in the country, Jewell vote no. On June 7 and December 9 of 1963, the bond issues for $1,200,000 was defeated. Over a period of almost four years, plans were cut back to save costs as inflation affected the project. After six unsuccessful attempts to gain a 60% majority favoring the issuances of bonds to construct a new junior-senior high school, the $1,425,000 issue voted on April 19, 1966 carried by a 65% margin. The successful vote was a result of a vigorous campaign on the part of the board and interested patrons to inform the voters in the district of the bond issue's importance. 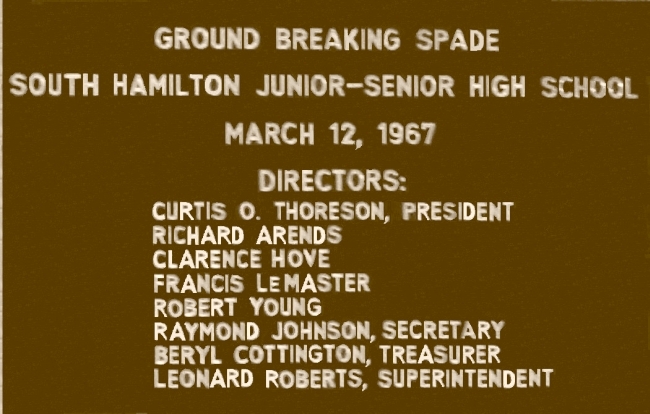 Finally in a special election on April 19, 1966, the seventh try for a school bond issue passed for construction of the new high school in Jewell. In September of 1966, the board succeeded in negotiating with the heirs of the Amos Erickson estate for thirty acres of land adjacent to the old Jewell school site at a cost of $42,000. This action made it possible to sell the $1,425,000 of bonds on September 26 at an interest rate of 4.247%. In the fall of 1968, students were moved into the new building. 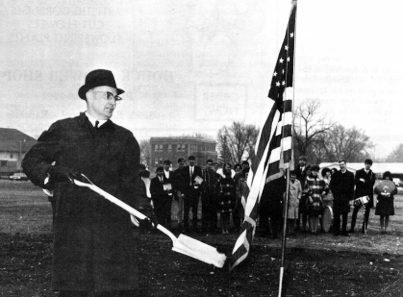 The ground breaking ceremony for the new South Hamilton junior-senior high building was held Sunday, March 12, 1967. 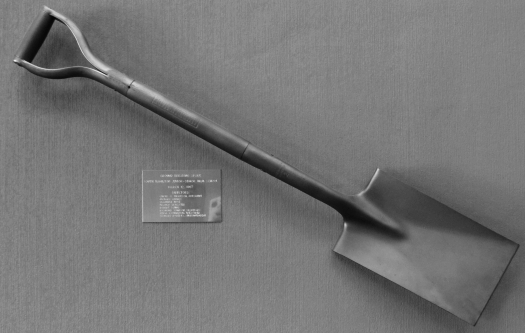 A brief ceremony was held at 3 PM, during which board president Curtis Thoreson turned the first spade full, followed by board members Richard Arends, Clarence Hove, Robert Young, and Francis LeMaster. Curtis Thoreson, board president The spade was then handed to a representative of the general contractor, Roth Associates of Storm Lake. Others on the program were the Rev. R. D. Ehlers of Ellsworth and Rev. Karl Miller of Stanhope and Superintendent Leonard Roberts. 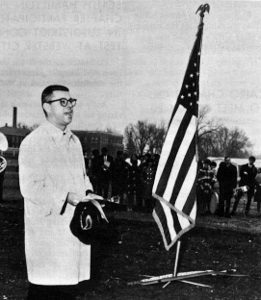 On December 29, 1968 the dedication of the new junior-senior high school building was held. (A booklet given out at this event explained many details. You may read a portion of the dedication below the following image.) A price had been paid, however, and disagreements over location caused delays. Because of increased costs, the new school was not really the same one envisioned by the architect and planning committee. Gone were the terrazzo floors, glazed block walls, indoor pool, and barrel-vaulted auditorium roof. The smaller band room, lack of storage space, and the poor quality windows and doors which later had to be addressed symbolized the cheapening of the planned school structure. And to understand the rights and duties of citizenship and to be diligent in the performance of obligations as citizens of the community, the state and the nation." After completion of the new junior-senior high school building, South Hamilton students were bused to the new school from a 205 square mile area which included the towns of Ellsworth, Stanhope, and Randall, in addition to Jewell. The twin junior highs, which had operated since 1962, were then no longer needed. The district school maintained an elementary with grades K-6 in each of the four towns. In the fall of 1971, The Randall school was changed to accommodate most students in grades 5-6, while the other three elementary centers taught grades K-4 with Stanhope still having their own grades 5 and 6. By the fall of 1972, all grades of 5 and 6 were in the Randall Center. Ninth graders joined the ranks of high school during the 1974-75 school year. In the Spring of 1976, another decision was made by the school board to close the two elementary centers in Ellsworth and Stanhope. Several new classrooms were added to the elementary in Jewell to accommodate this move, and grade four was added to the fifth and sixth grades at the Randall site. By the Spring of 1980, declining enrollment, inflation, and increased costs forced the closing of the Randall Center which was the single remaining school building outside of Jewell. In the Fall of 1980, two new classrooms were opened for the elementary building in Jewell, and all children were now schooled in Jewell. Student numbers in the district had declined from the initial high exceeding 1200 down to about 700 in the mid 1980s. When student numbers began to rebound in the early 1990s, a bond was proposed and passed in the late 1990s to add classrooms and modernize the elementary. By 2005, student enrollment approached 800.